Money. Power. Respect. Women. These are the things that motivate Cuban immigrant, Tony Montana. 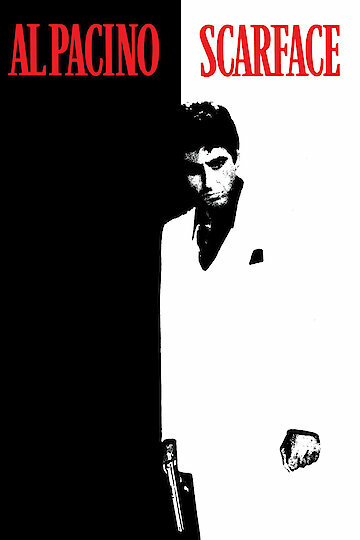 Scarface follows Tony Montana as he goes from an off-the-boat Cuban refugee to a powerful drug lord in 1980’s Miami. The fast life of drugs and women is inviting to Tony, as well as his best friend and partner, Manny Ribera. Manny, who is perhaps more motivated by the women than the money, is faithful to Tony, however Manny oversteps his boundaries in more than one way and the outcome is not positive. When he arrives in Miami, we see right away that Tony will do whatever is necessary to get what he wants. After he and his friends are released from the Cuban refugee camp, Freedomtown, Tony hits the ground running into the world of drugs, violence and corruption. Nothing will stop him from getting what he wants. The moral lessons taught to him early on fall on deaf ears. Tony is determined to not let anything stop him. Not even family is enough to encourage him to live on the straight and narrow path. We see the relationship with his mother is not good; she wants nothing to do with him. His sister, Gina, however, is enticed by the fast life and the money Tony brings. Even if she doesn’t agree with the way he handles business, she cannot stay away from the rewards he also brings. Gina is not the only one that tags along with Tony as he rises to the top. Cocaine and murder bring a good, fun life that is seemingly without limits to anyone that remains faithful to Tony. But, all good things must come to an end and everyone that surrounds Tony eventually meets their demise, with one notable exception. Tony himself, as ruthless as he is, is not a complete monster and when his morals get in the way of doing business, the results are surprising but not unanticipated. Scarface is a classic movie that takes the viewers on a ride with Tony. Some say he is a bad guy (even Tony says it himself) but, bad guy or not, we are still rooting for him in the end. There is even a lesson to be learned, if you want to look at it that way. Director Brian DePalma did a wonderful job of bringing this world alive and viewers may almost feel like they want to be in on the fun, as well. That is, until the end. Scarface is currently available to watch and stream, buy on demand at Amazon, Vudu, Google Play, FandangoNow, iTunes, YouTube VOD online.